Jasper — Day One! | NJNA is Blogging! For the first time — Sue and I are taking the same class at seminar! It is “Jasper” with Toni Gerdes. Most of you will realize that this is the third class I’ve had from Toni — this year! And the second — this week! Toni has groupies and I admit that I am fast becoming one of them. Her designs are spectacular and her instructions and classroom manner are A-Number-One! Jasper is very different from Navajo Blanket. Whereas in Navajo Blanket, the thread and stitches were wool and heavy enough to emulate a woven blanket, in Jasper we are using silk, cotton, soy, and even some wool threads. Toni says that she wanted this piece to have the texture to go with the rocks that will be used in the design and she also wanted it to be a sampler of different, unusual stitches. When Harold and I were in Sedona (see rosiesmidnightsun.wordpress.com) I went into a store that sold beads. Among the “beads” that were sold were many, many varieties of Jasper. It seems that Jasper can be blue, green, coral, gold, and beige. In our piece we are using Leopard Jasper and Autumn Jasper beads. It is beautiful, but I can’t help thinking that it will go better in my Mom’s house than in mine. First Day Progress on Jasper! Soy thread? That’s a new one to me. 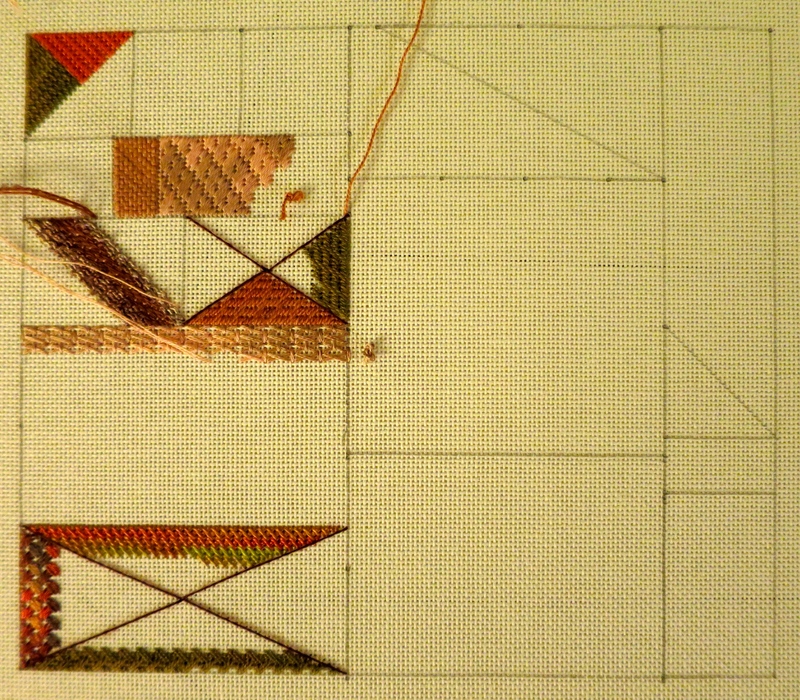 Fabulous stitches to teach us in 2015? Hope so.